Don’t let your small space hold you down, just get creative! 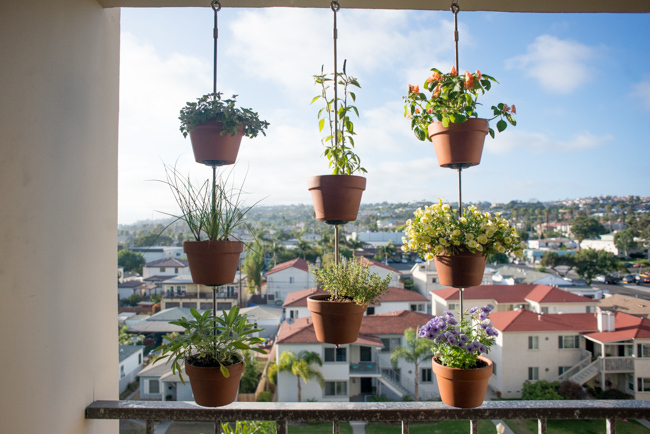 For an attractive, space-saving vertical garden, you can install hooks on the ceiling of your balcony and let pots with herbs, small vegetables and pretty flowers hang without taking up valuable floor space. Check out more creative hanging planter ideas. Don’t have room for a table and chairs? You can still enjoy the city views or the green trees surrounding your small space by installing this table over the railing. Tuck two chairs on either side for even more relaxing vibes. Check out these no-maintenance deck rails. This fun idea is perfect for bringing the party for two outside. The pull-down door doubles as a surface for all your cocktail hour needs. When you need more room, simply store everything back in the cabinet and lift up the door for more balcony space. Take a look at these 15 home bar ideas for the perfect bar design. For optimum seating in a small space, utilize the walls of your balcony to create a wrap-around bench. You can make the L-shaped bench as small or big as you need using concrete blocks, crates, etc. Need more bench inspiration? Here’s how to build an outdoor trestle bench. Cut two pieces of wood in a triangle shape to fit perfectly in the corner of your balcony. You can use the space to rest your drink, book, and sunglasses, while also placing tiny succulents on the shelves for decoration. Check out these DIY floating shelves. 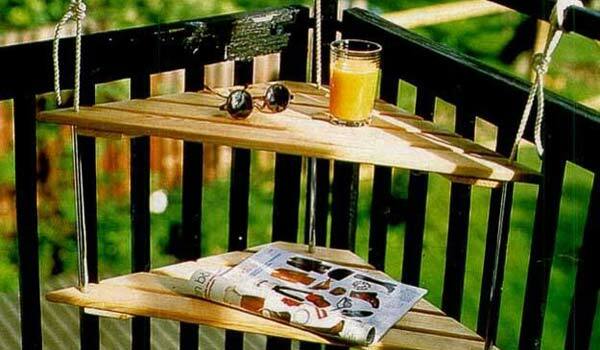 Create an outdoor desk by hanging a mini table over your railing. So long as you have room for a small chair, you’ll be able to get your work done on your laptop in the fresh air. Another small space idea: How to turn a closet into an office. To store your go-to balcony needs, like a watering can and sunscreen, as well as display your pretty potted plants, stack crates vertically along the wall. Also be sure to check out how to build a bookcase with crates. 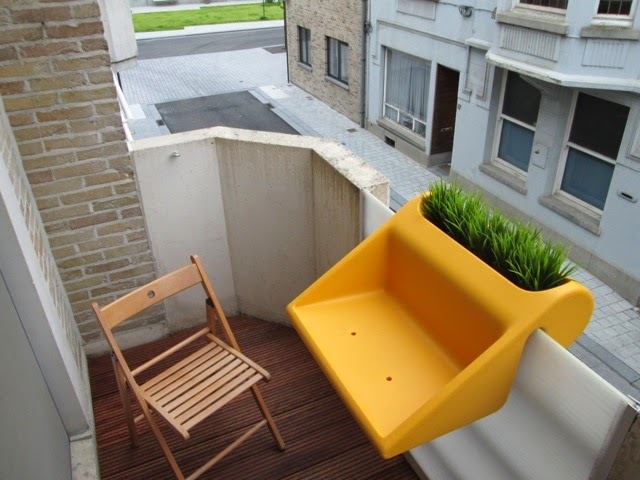 Because small balconies aren’t all that functional, they are often a place to just store whatever! But once you clear up floor space, you won’t believe how many things are possible. For starters, pick up your bike and hang it on the wall. Here’s how to build a wall-mounted bike rack with storage. Sometimes you want to sit with a book and a cup of coffee on your balcony, other times you want to move around and water your plants or do some yoga. 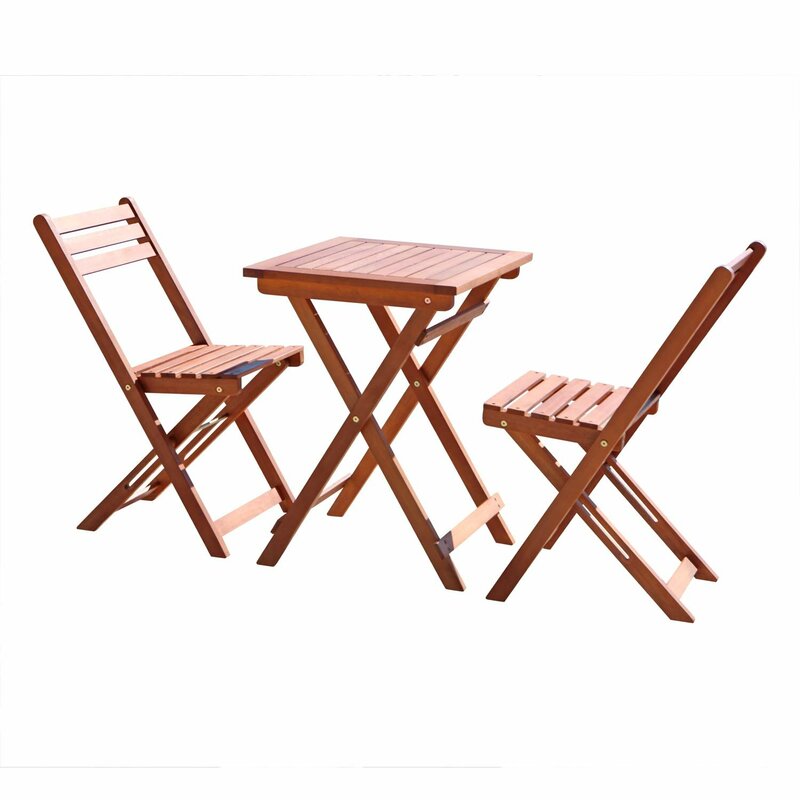 A folding bench and chairs makes for the perfect space-saver when you need more room. 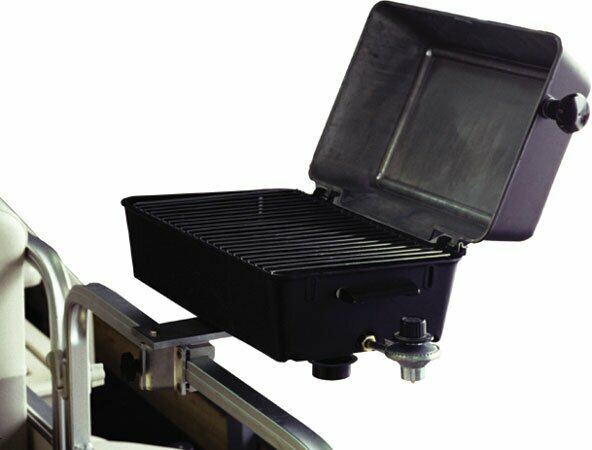 Check out this transportable fold-up grill table for your next cookout! If all you want to do is get your BBQ game on, don’t let your small balcony get in the way. While grills typically take up a lot of space, this version fits right over the railing. Check out these must have grill tools and accessories that will upgrade your BBQ status. If you want your balcony to have as much room as possible, you should seriously consider Spaceless. The concept, by Sandy Lam, entails integrated furniture that simply pops up, and when you’re all done sitting and chilling, it remains hidden in the decking area. Pretty cool! On the subject of built-ins, check out how to build a built-in bookcase. 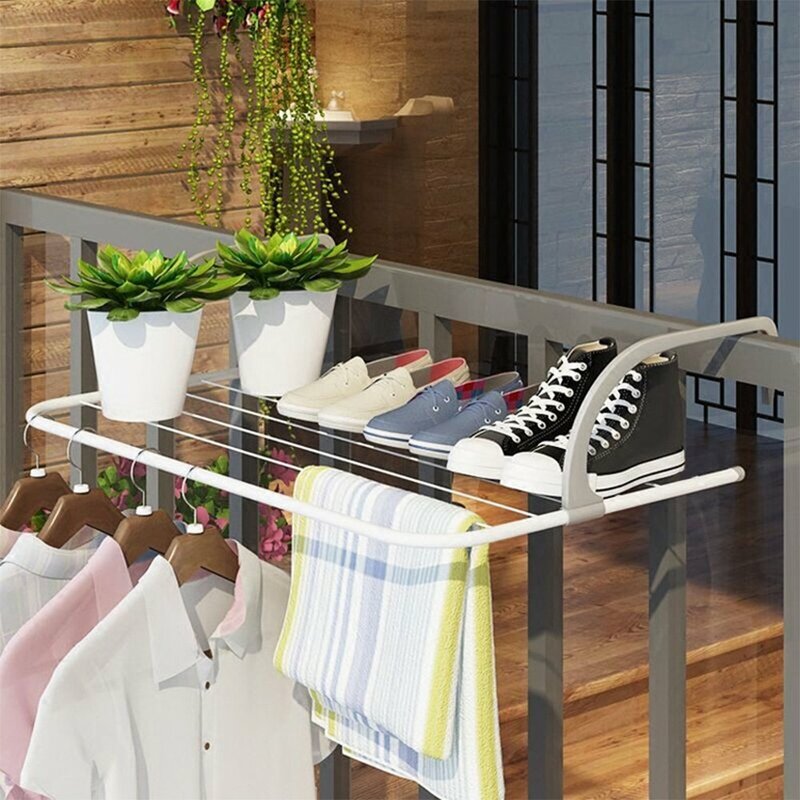 Whether you have clothes you want to air dry, shoes you want to air out, or need an extra place to put a potted plant, this versatile and space-saving rack is perfect for your small balcony! You should also check out this space-saving wood trim drying rack. 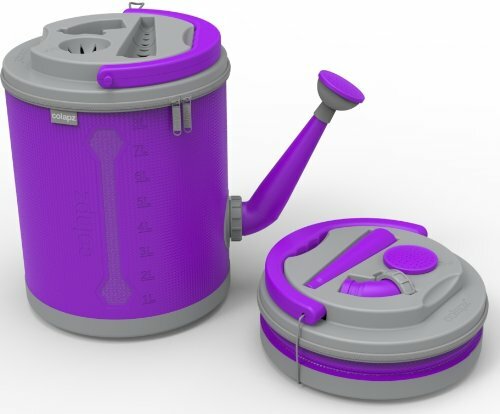 Watering cans can take up a lot of space, especially on a small balcony, but this collapsible option is an incredibly clever watering can that transforms into a slim design when it’s empty. Also check out this nifty Nimbus self-watering flower pot. Cozy up to the bar even in a small space with an over-the-railing balcony bar. It takes up no floor space while providing you plenty of food and drink space! Want to build a home bar? Here’s how to do it!